Note: I wrote this investigative story during the second month of my internship at the Gazette in London. I also started the paper's Twitter account and trained the staff on social media usage. 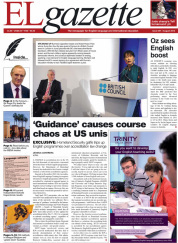 A change in accreditation law in the US has left thousands of universities concerned about the future of their English programmes. However, the Department of Homeland Security has indicated to the Gazette a simple solution: a letter from accreditation agencies. Enacted in December 2010, the Accreditation of English Language Training Act requires all intensive English programmes (IEPs) to be accredited by a national or regional agency to enroll international students. IEPs are typically English courses leading to university entrance and often based on campus. However, they are not necessarily owned and operated by universities themselves. whether they are managed by a university. This is where the problems began. Regional and national accreditation bodies certify universities as a whole – not specific courses. SEVP began ‘out-of-cycle’ reviews and IEPs received notification that they had to provide documentation of their courses’ accreditation within ninety days. But administrators were at a loss for how to respond. Bronwyn Jenkins-Deas, associate dean of international education programmes at University of California, Riverside, said her university, the largest recruiter of international students in the country, spent five months trying to properly satisfy SEVP’s requests. Associations such as the American Association of Intensive English Programs (AAIEP) and University and College Intensive English Programs wrote letters and statements to SEVP, trying to find answers. But other than a confusing comment made by a Department of Homeland Security at an international education conference, they received no response.